Kaboo is more than a casino; it is an adventure. The online casino goes above and beyond to provide the best possible experience for users. Kaboo captivates users and keeps them coming back through unique and engaging games and a storyline to go along with them. The casino offers the world’s best games that are each tied into a story, or a chapter of “The book of Kaboo” unique to this site. Each chapter tells a different story. The casino and its offerings are constantly evolving as users face new and challenging missions that provide the opportunity to earn Echoes. The interface is flawless and captivating as well. It is evident that Kaboo has put extensive work into ensuring users are hooked from the minute they see the site. 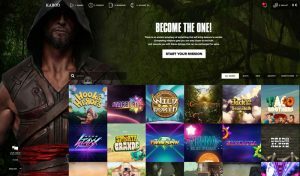 The theme is subtly darker than other sites in a way that immerses users as inspiration is drawn from various media outlets from video games to movies to pop culture. Kaboo offers many world renowned online games for users. The full game selection is only available to those with an account, however, players can expect to see most of their favorite games on the list. The games vary from slots to jackpots to table and card games among others. Slots are the focus of Kaboo, as they offer one of the widest selection of online video slots on the internet. The familiar and popular slot games include Blood Suckers, Dead or Alive, Sugar Pop, Twin Spin, Wild Water, Golden Goddess, and many more. Seventeen jackpot games have also been added to the selection of offerings as well as popular table games such as Atlantic City Blackjack Gold, Double Exposure Blackjack, Joker Poker and so many more. The casino offers 20 different kinds of blackjack alone. The rewards are fair and well correlated to a user’s playing preference. Rewards and features are given in the form of Echoes which are the currency of Kaboo. These Echoes can be used to access and purchase free spins. These are without wagers so it is profitable for users. Current providers include: NetEnt, Microgaming, Quickspin, IGT, Ash Gaming, GTS, Blueprint, Playtech, Nextgen, Elk Studios, NYX, Thunderkick, Rabcat and PlaynGo. BetSoft, Yggdrasil and WMS. There are more than 600 games offered by 14 leading game developers. Users get 5 Echoes and a 50x playthrough when they activate their account. Upon their first deposit, they will receive a £200 Welcome Bonus in addition to 100 free spins. Their second deposit earns them an 100% bonus up to £100 + 50 Echoes. Furthermore a 30x playthrough bous is offered as well. Free spins are one of the only bonuses offered on the site as Kaboo avoids draws, sweepstakes, slot tournaments and other tournaments. Kaboo is a leader in mobile games as it offers an HTML 5 design which means that users can access the site from browsers on their phone, tablets and other mobile devices as long as they are powered by iOS or Android. This makes the games more accessible as users can avoid any special downloads of apps or games. The mobile site is a wide range of games and an interface that parallels the site’s futuristic theme and design. Some of the mobile games include Mega Fortune, Starbust and European Roulette Touch. Kaboo Casino accepts all major credit and debit cards as well as online bank transfers, pre-paid cards, several e-wallet options and bank transfers. These methods can also be used for cashing out. The maximum one user can withdraw in 24 hours is £50,000. The customer service team is happy to help resolve any issues that may arise for users. The phone, email and web chat are open from 10 a.m.-midnight seven days a week.